Preparation of the National Register of Citizens (NRC) in Assam, the final draft of which was released on 30 July 2018, was not a suo motu exercise undertaken by the Government of India. Its origins date back to 1951 when it was first prepared following the demand of most of the political organisations in the state. It has since been updated at the insistence of the Supreme Court. There have been state-wide agitations too by bonafide citizens against loss of jobs and demographic changes caused by illegal immigration. The Assam Accord signed in 1985 by then Prime Minister Rajiv Gandhi and the organisations that had been demanding identification and deportation of illegal immigrants, helped further strengthen its contextual relevance. The document, therefore, has a valid political background even as the need for the resolution of the issue of illegal immigration, which has snowballed over the years, has been increasingly felt by bonafide citizens of the state. Illegal immigration is not merely a state’s problem but a serious issue for the entire nation. It is a specter that has been haunting us ever since we got Independence. India’s porous borders with Bangladesh have made it possible for migrants from that country to infiltrate bordering states like West Bengal and Assam. Indian states that share international borders with Bangladesh are seriously hamstrung in pushing the infiltrators back owing to the hostile ground conditions, what with India being the fifth longest land-border-sharing country (4,096 kms) in the world. Security agencies face operational problems in enforcing zero infiltration at the best of times due to the harsh border terrain. An estimated 20 million illegal immigrants from Bangladesh are believed to be living in India although the actual figure could be much higher. In addition, about 300,000 people are infiltrating into the country every year. India has thus become a safe haven for illegal immigrants continually pouring in from Bangladesh. The infiltrators find neither religion nor culture nor language a problem in the India owing to the commonalities they share with the people of these states. They manage to get fake or even bonafide documents like Aadhaar, PAN and Voters Card in support of their claim for citizenship for a price, by producing fake supporting documents, courtesy corrupt officials, fake operators or obliging state governments that see in them a vote bank. Once they get a toehold in India and arm themselves with identification documents, they fan out not only to Assam but practically all over India where they are hired by unscrupulous employers as cheap labour without verification of their citizenship status and antecedents. The presence of illegal immigrants vitiates the job market as well as the law and order situation. It also causes a drain on the state’s resources and leads to bitterness and unrest among local people. Unethical state governments pander to the infiltrators and help them settle down and receive state support, much to the displeasure of the bonafide citizens who end up losing out on jobs, land, welfare schemes, etc. This leads to the electoral results in these states not reflecting the true will of bonafide citizens. What is more, the infiltration results in demographic changes with far-reaching consequences – religious, social and political. It is but natural that local community which adopts small family norms in self-interest as well as for the promotion of the nation’s developmental agenda, feel sore when they find in their midst illegal immigrants, with practically no self-restraint on this account, hogging full benefits of welfare measures and other forms of social support extended by the state, resulting in redundant and wasteful expenditure. This state of affairs is far from conducive to the social harmony and could have disastrous consequences on the territorial integrity of the country if allowed unchecked. Furthermore, the possibility of this segment of the population becoming a breeding ground for terrorists and anti-nationals cannot be ruled out. The final draft of the NRC does not include names of 40,07,077 people. This has sent ripples among the Assamese population who have, however, maintained peace and tranquility following assurances from the government that there is no need to panic; there will be no punitive action against those who are left out and the status quo will be maintained on their status and rights, till finalization of the NRC due on 31 December 2018. As regards their voting rights, the Election Commission is to take a call. The Opposition political parties have, however, predictably reacted with harsh criticism and condemnation. While Congress President Rahul Gandhi has called the NRC exercise tardy and called for an all-party meet, Mamata Banerjee of TMC has lambasted the exercise and its end product as divisive in nature, aimed at turning Bengalis and Biharis out of Assam. She has slammed the Modi government for resorting to “vote bank and divide-and-rule policy” and has offered shelter in her state to people who are left out. She even tried unsuccessfully to send a delegation of legislators and party men to Assam. Worried about the possibility of a similar exercise in her state post-2019 polls, she is even reported to have warned of a civil war as a possible consequence. Despite the Opposition’s fears, it is noteworthy that all communities living in Assam had overwhelmingly cooperated with the authorities in the process of updating of the NRC. This was hardly surprising since the demand for the process had emanated from the people themselves. For the same reason, full cooperation from the people may be expected during the run-up to the finalization of the document and subsequent to its publication. Besides, there is no alternative to the NRC for the documentation of the population. In any case, both the central and the state government have already allayed the apprehensions of those left out with the assurance that they have recourse to appeal. Opposition parties have criticized the NRC of being violative of human rights and democratic rights of the affected people. As the mandate of the exercise was very precise, namely, identification of the people without valid documents, and the exercise was in accordance with the demand of the people, and carried out under the supervision of the Supreme Court, for the Opposition to argue now that NRC has deprived those who failed to make the cut of their human and democratic rights is nothing but the political equivalent of asking for an omelette without breaking an egg. In any case, the peace-loving people of Assam would rather like a final resolution on the issue of illegal immigration without any further delay than be mute witnesses to a game of political football over a non-issue. What is more, the people of the North Eastern states of Manipur, Meghalaya, Nagaland and Arunachal Pradesh have joined the bandwagon and demanded NRC in their states too to check the vexatious problem of illegal immigration. It is even in the accord that national register of citizens will be updated so that legal inhabitants of Assam are given their due share in resources and unlawful residents are sent back to their homeland. Oppostion has problems with triple talaq, GST and demonetisation. They have issues with NRC and they are criticising surgical attacks. Why then not agree that they are anything but nationalist? The left political class and media outlets will blame the BJP of being a majoritarian and authoritative government. It is in their interest to condemn such important exercise. The important question is why these people who we term as illegal migrants came to India from Bangladesh. If they came to take refuge from persecution in their home country they must be welcomed. Leave Assam or West Bengal, there are illegal migrants hiding in national capital and other big cities of India. What about them? Will NRC be updated only in Assam? Every policy decision of BJP government is fair and free from any bias. Had it been the congress party, everyone would have praised their action or kept silent. The issue is not about Hindu or Muslims. Here the concern is that we already have very limited resources with such high population hence unlawful inhabitants must be sent back. We are to understand that NRC was not ordered or initiated by the Modi government but it was ordered by Supreme Court and initiated with court having due knowledge of the matter. In the name of conducting an exercise to determine who legally crossed the border, the Indian government is only targeting Muslim minority. It is in the open that illegal migrants, specifically from Bangladesh, alter the results of elections. 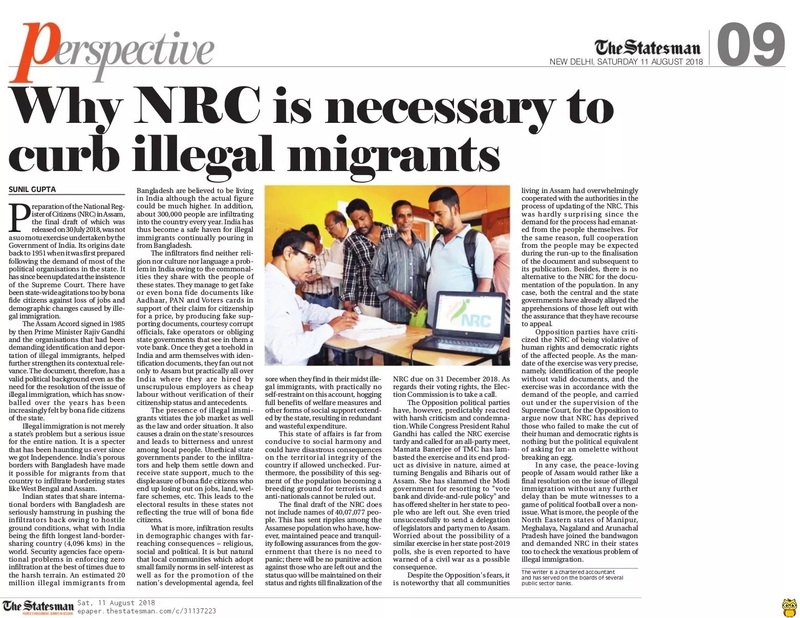 Better is to extend the NRC to entire country and weed out appeasement of non-citizens.